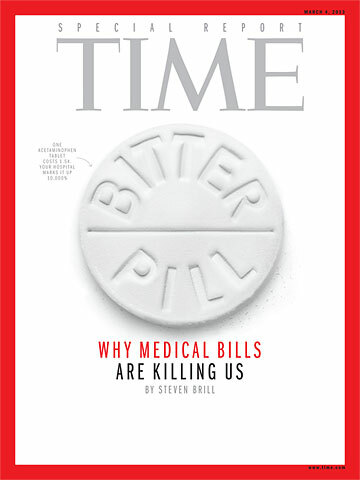 The March 4, 2013 TIME Magazine Special Report by Stephen Brill1 “Why Medical bills Are Killing Us” demonstrates a series of narratives that describe problems in our health care system. The focus of the article relates to the cost of health care services. He states that the responsibility for the health care cost problem is primarily with the insurance companies, DME manufacturers, hospitals (both for-profit and not-for-profit), and pharmaceuticals. The excess cost by and large is not related to physician and patient behaviors. Brill suggests that real solutions might be related to lowering the age for Medicare eligibility, and to implementing a single-payer system. He further states that these solutions are not feasible. Brill then offers incremental solutions that include tightening anti-trust laws, tax profits up to 75%, tax surcharge on all non-doctor hospital salaries, outlaw the chargemaster, amend patent laws, medical malpractice reform, and cap insurance payments for imaging. So, there is little good news on the campaign on health care reform. The good news is that the situation is overwhelming. It appears that tinkering around the edges of America’s dysfunctional system for funding health care with private insurance companies and pharmaceutical companies is over. No small reform such as those suggested by Brill will begin to adequately control the legalized theft of the health care dollars. Do citizens want a single payer health care system? YES! The question is asked; “Do you favor or oppose having a national health plan in which all Americans would get their insurance through an expanded, universal form of Medicare-for-All?” The survey demonstrates that 58% of the citizens favored a government plan2. The assertion by Brill that a Medicare for All is unrealistic is challenged by the citizens. Further the assertion that risk is related to giving all that power to government is not documented by Brill. In fact the survey suggests that citizens trust the government over the trust given to private insurance companies. A movement is underway. This movement defines that the private insurance companies can be beaten. Comment: Universal health care financed by a public single-payer system seems to be the only solution for our health care crisis. This is best done as a national plan Improved Medicare for All, but may be a movement initiated at the state level. 1. Brill S. Why Medical Bills Are Killing Us. Time, Special Report; Vol. 181, No. 8, 16 – 55; March 4, 2013.